1. Get the detailed information from the customer about the symptom (the condition and the environment when the incident/malfunction occurred). 2. Check operation condition of the function that is malfunctioning. 1. Check DTC for BCM. 2. Perform the following procedure if DTC is displayed. - Study the relationship between the cause detected by DTC and the symptom described by the customer. 3. Check related service bulletins for information. Is any symptom described and any DTC detected? Symptom is described, DTC is displayed>>GO TO 3. Symptom is described, DTC is not displayed>>GO TO 4. 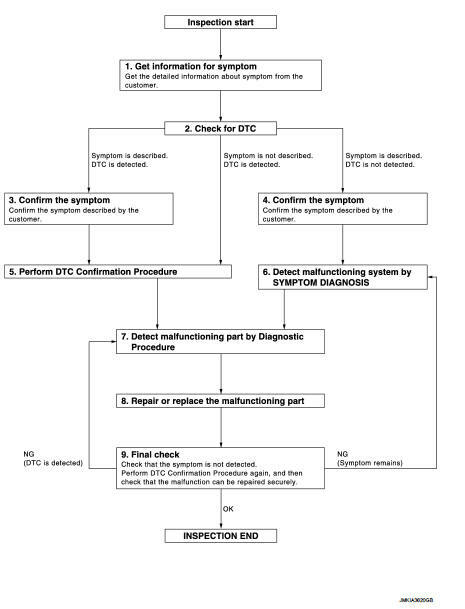 Symptom is not described, DTC is displayed>>GO TO 5. Confirm the symptom described by the customer. Connect CONSULT-III to the vehicle in “DATA MONITOR” mode and check real-time diagnosis results. Connect CONSULT-III to the vehicle in “DATA MONITOR ” mode and check real-time diagnosis results. If two or more DTCs are detected, refer to BCS-140, "DTC Inspection Priority Chart" (BCM) and determine trouble diagnosis order. NO >> Refer to GI-42, "Intermittent Incident". Detect malfunctioning system according to Symptom Diagnosis based on the confirmed symptom in step 4. Inspect according to Diagnostic Procedure of the system. The Diagnostic Procedure is described based on open circuit inspection. A short circuit inspection is also required for the circuit check in the Diagnostic Procedure. 1. Repair or replace the malfunctioning part. 2. Reconnect parts or connectors disconnected during Diagnostic Procedure again after repair and replacement. 3. Check DTC. If DTC is displayed, erase it. When DTC was detected in step 9, perform DTC Confirmation Procedure or Component Function Check again, and then check that the malfunctions have been fully repaired. When symptom was described by the customer, refer to the confirmed symptom in step 3 or 4, and check that the symptom is not detected. Are all malfunctions corrected? NO (DTC is detected)>>GO TO 7. NO (Symptom remains)>>GO TO 6.